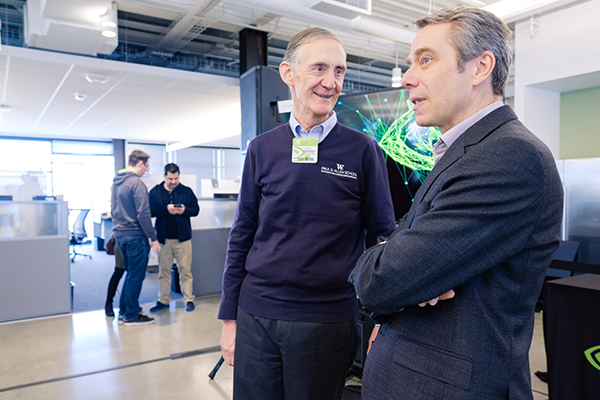 In yet another sign of the Puget Sound region’s emergence as a center of advanced robotics and artificial intelligence research, NVIDIA last week marked the official opening of its new AI Robotics Research Lab just blocks away from the Allen School and University of Washington’s Seattle campus. 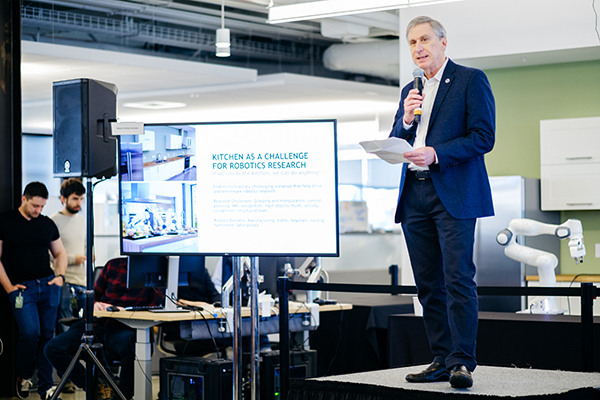 Led by Allen School professor Dieter Fox, NVIDIA’s new lab in the UW CoMotion building will bring together multidisciplinary teams to focus on the development of next-generation robots that can work safely and effectively alongside humans. 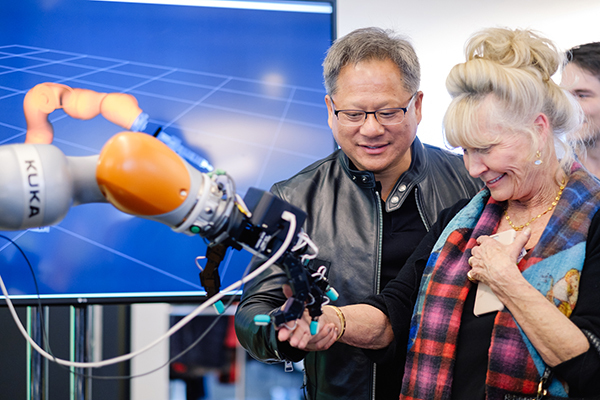 NVIDIA CEO Jensen Huang and a guest get hands-on with a touch-sensitive robot on display in the Seattle lab. To get there, Fox and his colleagues will need to make progress in a variety of areas, spanning artificial intelligence, robotic manipulation, machine learning, computer vision, natural language processing, and more. Noting that the new lab intends to publish its research so that it can be built upon by others — “we aren’t keeping it to ourselves” — Fox emphasized that its work will be a collaborative endeavor through which researchers from NVIDIA, UW, and other leading universities would push the field of robotics forward. That sentiment was echoed by NVIDIA CEO Jensen Huang, who emphasized that the culture of collaboration that underpins UW research was also “the perfect culture for creating a robotics platform” in a city that he regards as “one of the greatest hubs of computer science in the world,” thanks to the presence of UW, Microsoft, Amazon, and many others. To learn more, read NVIDIA’s blog post and check out coverage by The Daily, GeekWire, MIT Tech Review, IEEE Spectrum, Robotics & Automation News, The Robot Report, Engadget, Hot Hardware, eTeknix, Neowin, SD Times, and the Puget Sound Business Journal (subscription required).